The Epistle of Jude. The epistle is titled as written by "Jude, a servant of Jesus Christ and a brother of James" (NRSV). If taken literally this means that the author is a brother of Jesus, an attribution which is now increasingly considered as the most probable. Though it is held as canonical in the majority of Christian churches, some scholars consider the letter a pseudonymous work written between the end of the first century and the first quarter of the 2nd century, arguing from the references to the apostles (verse 1:17-18), tradition (1:3); the book's competent Greek style and the opposition to Gnosticism. Nevertheless, conservative scholars date it between 66 to 90. 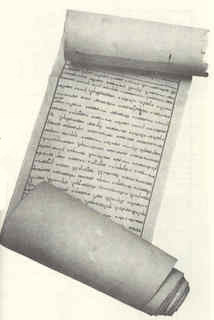 The Epistle of Jude is a brief book of only a single chapter with 25 verses. It was composed as an encyclical letter—that is, one not directed to the members of one church in particular, but intended rather to be circulated and read in all churches. The form, as opposed to the earlier letters of Paul, suggests that the author knew Paul's Epistle to the Ephesians or even that the Pauline epistles had already been collected and were circulating when the text was written. The epistle's style is combative, impassioned, and rushed. Many examples of evildoers and warnings about their fates are given in rapid succession. The epithets contained in this writing are considered to be some of the strongest found in the New Testament. The epistle concludes with a doxology, which is considered to be one of the highest in quality contained in the Bible. The fact that the Epistle of Jude is notably similar to Second Epistle of Peter indicates the possibility that the writing of one of the epistles was influenced by the content of other. Because this epistle is much shorter than 2 Peter, and due to various stylistic details, the scholarly consensus is that Jude was the source for the similar passages of 2 Peter. The Epistle of Jude references two other books, one which is non-canonical in all churches, the other non-canonical in most churches. Verse 9 refers to the dispute between Michael the Archangel and the devil about the body of Moses. A passage in a non-canonical book, the Assumption of Moses, provides an account of this dispute. Verse 14-15 contains a direct quote of a prophecy from the Book of Enoch. It also attributes the quote to "Enoch, the seventh from Adam", indicating Jude accepts the antediluvian patriarch Enoch as the author. The Book of Enoch is not considered canonical by most churches, although it is by the Ethiopian Orthodox church.